The iconic sailing venue, home of the America’s Cup 2007 and 2010, will host the fourth stage of the RC 44 Championship Tour 2010. 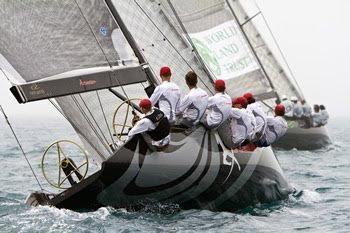 April 22, 2010 – The RC 44 Class announces today that the fourth stage of the Championship Tour 2010 will take place in Valencia, Spain, on July 27 – August 1. The RC 44 Valencia Cup will follow the regattas held in Dubai (UAE), Lake Traunsee (AUS) and Copenhagen (DEN) earlier in the year. Jorge Gisbert, General Director Consorcio Valencia 2007, added: "We are delighted to welcome the RC44 Championship Tour in Valencia, further consolidating the city's position as a foremost sailing venue. Together with the Real Club Náutico de Valencia and the Spanish and Valencian Sailing Federations, we look forward to welcoming all the RC44 teams to the Marina Real Juan Carlos I and to repeating the success of the last two editions of the America's Cup. We hope the teams feel at home here and that the Valencian public enjoys a fantastic show." The RC 44 Championship Tour is one of the world’s top sailing events. With six events spread in the Middle-East, Europe and the United States, it involves up to twelve international teams that include last year’s winner Team No Way Back (Pieter Heerema / Ray Davies), Artemis (Torbjorn Tornqvist / Terry Hutchinson), CEEREF (Igor Lah / Rod Davis), BMW ORACLE Racing (Larry Ellison / Russell Coutts), Team Aqua (Chris Bake / Cameron Appleton), Team Islas Canarias Puerto Calero (José Juan and Daniel Calero / José Maria Ponce), Katusha (Paul Cayard), Team Sea Dubai (Markus Wieser), RC 44 Challenge (James Spithill) and Team Austria (René Mangold / Christian Binder). The RC 44 Valencia Cup will begin on Tuesday with the match racing event. After a full round robin held over two days, team owners will take the helm for three days of fleet races. J24 Erin sinks in 30 knot broach. Can the Favourites Win Match Race France?